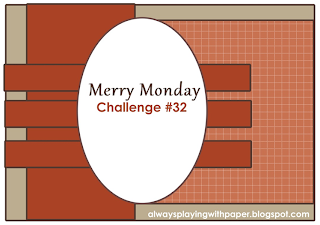 Here's My Card for the Merry Monday Challenge #32 at Always Playing With Paper. The colours are Cherry Cobbler, Gumball Green and Very Vanilla. The DSP is from Festival of Prints and the Cherry Cobbler cardstock is the new Core'dinations. All products are from Stampin' Up! Very pretty! I love all of the patterns on your card. 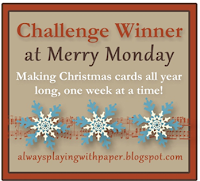 Thanks for taking part in the Merry Monday challenge this week! This has such a beautiful christmas colors! The image is pretty as well. Great card! Just gorgeous...simple, but your beautiful blend of colors and images have created a card that is very pleasing to the eye! So glad you could join us this week at Merry Mondays! Beautiful card, Tiz! Love the colors and your papers! Oh, how pretty, Tiz! I love the mix of papers and that pretty holly image! Thanks for sharing it with us at Merry Monday! Very pretty card, fantastic paper. Thank you for joining us for Merry Monday this week. Thanks, Lesley, and everyone who left comments; and special thanks to LeAnne who chose me as winner this week. So thrilled and excited to be asked to be guest designer. Can't wait to see what that entails. My name is Elizabeth, but all my friends call me Tiz. I have been crafting all my life but when a good friend introduced me to stamping and card making about 3 years ago I was hooked! Now I am totally addicted; it is great therapy! I love playing along with various challenges on many wonderful blogs so I decided to start my own blog as a place to host them. Now that I am retired I have a lot more time to play! I have been an independent Stampin' Up! Demonstrator since November 2010. I love offering classes for my friends but mostly I consider myself a “hobby” demonstrator. I have been married to my wonderful husband for 37 years and have two grown children and two beautiful grandchildren. Catherine and Cathy Create Design Team Member! All content is my sole responsibility. Simple theme. Theme images by bopshops. Powered by Blogger.